Older individuals have a high prevalence of chronic or persistent pain that negatively impacts quality of life measures and functionality, and approximately 45% - 80% of long-term care facility (LTCF) residents are estimated to suffer from chronic pain. (Jablonski A, Ersek M. J Gerentol Nurs. 2009;35:28-34) This issue needs to be addressed as the aging population continues to grow and increasing numbers of individuals will be residing in LTCFs. 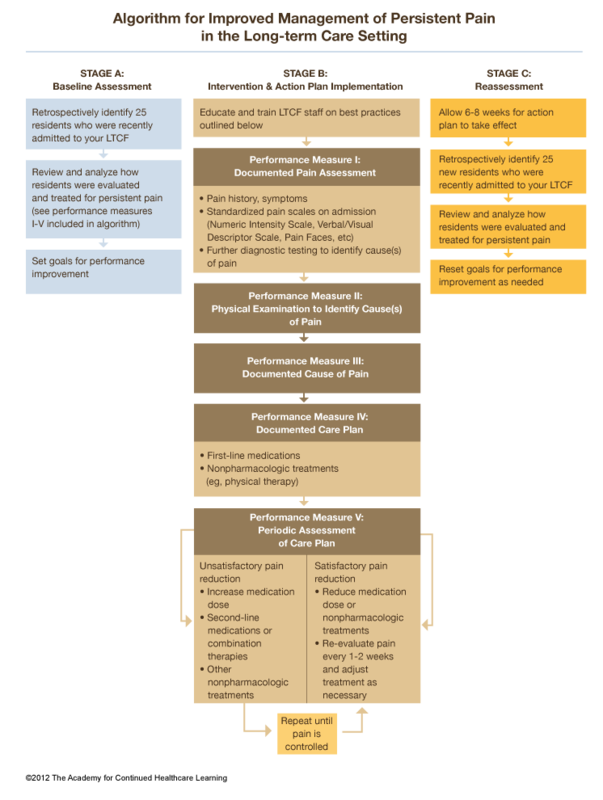 A performance improvement CME activity was developed to help clinicians in LTCFs improve the assessment and treatment of their residents’ neuropathic pain. During the course of the activity, the scope and resulting resources were expanded to include persistent pain. This toolkit was based on the PI CME activity and provides clinicians with additional LTCF tools, resources and strategies to implement their own performance improvement activity. This QI CME activity was co-sponsored by The Academy for Continued Healthcare Learning and the University of Michigan Medical School, and supported by an educational grant from Pfizer, Inc.
Below is a list of resources and activities available to Long –Term Care Facilities (LTCF) and clinicians, for implementation as part of Stage B. Please select the education to include in action plans based on what is most relevant to your needs, and the actions that you feel will be most helpful in achieving the goals identified. This is not a comprehensive list of resources or interventions available for Stage B; you may determine other education or action plan components that are more relevant based on your specific performance goals.